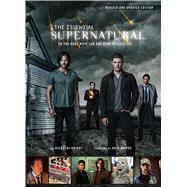 Go back on the road with Sam and Dean Winchester in this revised and updated edition of the best-selling The Essential Supernatural. Filled with interviews with the cast and crew of the hit show, stunning behind-the-scenes-imagery and art, and a wealth of thrilling removable items, this updated version includes new chapters on seasons 8 and 9 and a preview of the upcoming season 10. This deluxe edition dissects the show season by season, state by state, tracking the Winchester brothers as they travel across the U.S. in their distinctive classic car. Join them as they hunt all those things that go bump in the night, seek vengeance on the Yellow-Eyed Demon that killed their parents, deal with the Knights of Hell, and stop the bona fide Apocalypse! Illustrated with full-color images, behind-the-scenes photos, exclusive production art, and other elements—such as continuity photos and even the covers of the in-universe Supernatural novels by Chuck Shurley—this is the ultimate guide to Supernatural for the show’s legion of fans. Nicholas Knight has more than 300 credits that cover the spectrum of action, adventure, comedy, romance, science fiction, and young adult fiction. He has written Supernatural episode guides for every season and is a regular interviewer for the Official Supernatural Magazine. He lives in Vancouver, British Columbia.